A year ago Panasonic unveiled new 65" 4K OLED TV prototypes, later showing the same prototypes at CES 2015. Those OLED TVs used LG Display's WRGB 65" 4K panels, and Panasonic executives promised to release these TVs later in 2015. According to a French blogger, Panasonic is going to unveil their first OLED TV model at IFA 2015 next month. The model will be called 65CZ950 and it will be a curved 4K 65" TV that supports HDR. Sony and Panasonic halted their OLED TV joint development project in December 2013, and Panasonic (together with JDI, Sony and the INCJ) formed a new company (JOLED) to develop small/medium OLED panels. But the company OLED TV program is reportedly halted (or slowed-down at best) and as we said the company's upcoming OLED TVs use panel supplied by LG Display. 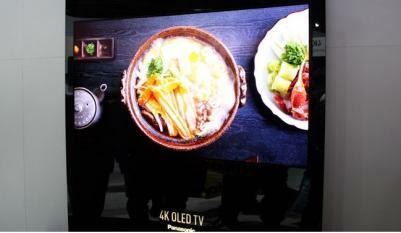 If Panasonic does introduce an OLED TV, I think it will be good for the market. Personally, I have no interest in a curved model, but I might consider a 65" flat model. definitely good to hear of more competition. Hopefully it will cause LG to step up their game as well! Maybe one of them will release a flat model too. LG recently announced the release of flat models. Panasonic, I want you to make a 60" 1080P OLED TV with your best image processing technology that made Panasonic plasma's the display to have. Why? Because 1080P is the current standard and there is k-gillions of 1080P material available versus very little 4K and no HDR material. But the TV should be HDR ready and upscales to 4K because upscaled 4K on a 1080P OLED would be beautiful. Therefore one of the HDMI inputs would need to be for 4k devices. This allows me and millions like me to keep my current blu ray machine, material and continue to buy blu ray material well into the future. But my overall belief principle is that 1080P OLED would be superior in picture quality compared to 1080P LCD/LED; 4K LCD/LED; or even 4K OLED. I think that a Panasonic TV such as I've specified would be a market success by providing a new display TV technology in terms the public already has and is happy with. We have had 1080 for a while now and we are happy with the results. And so far the highest quality 1080P displays rivel 4K picture quality and no one can argue OLED absolute black pixels. The perfect TV!!! Example that isn't available any longer: Panasonic Plasma TC-P65ZT60 65". Give me a 1080P OLED display with the image processing technology driving that plasma display. Gentlemen that's all I need and my money would go there if you make it. My current TV, Panasonic TC-P58V10.